Global Travel Media » Blog Archive » The Helloworld Travel Frontliners Forum Awards Triumph in Fiji! The Helloworld Travel Frontliners Forum Awards Triumph in Fiji! 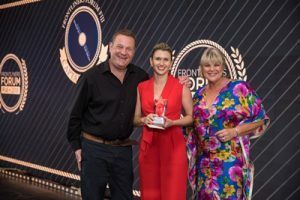 The 2018 Frontliners Forum came to a close in Fiji on Saturday 10 November, with the highly anticipated Gala Awards Dinner presented by World’s Leading Cruise Lines. 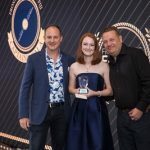 Held at the Denarau International Convention Centre, the awards recognised the Helloworld Travel top achievers from across the Branded and Associate networks. The evening thrilled attendees with an impressive performance by Immaculate Madonna that had everyone up on the dancefloor, followed by DJs who kept the party doing well into the early hours. The highlight of the evening was the presentation of the awards, recognising outstanding achievement throughout the year. Associate Consultant of the Year State Winners (L-R in photo): David Padman, Helloworld Travel, Martine Hero, GlobeNet Travel, Bianca Waru, Travelkey, Angela Kaluzyn, Skilled Travel, Megan Hermann, Phil Hoffmann Travel Barossa Valley, John Constable, Helloworld Travel. Branded Consultant of the Year State Winners (L-R in photo); Julie Primmer, Helloworld Travel, Jill Johansen, Helloworld Travel Mackay, Alex Whitehead, Helloworld Travel South Melbourne, Kelsey Farmer, Helloworld Travel Belmont WA, Scott McGlynn, Helloworld Travel Winston Hills, John Constable, Helloworld Travel. 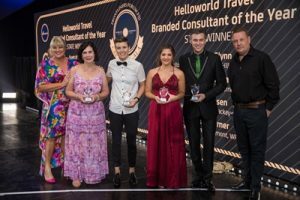 And congratulations to all the Helloworld Travel agents who were recognised across the various other categories for outstanding achievement. Sponsors for the 2018 Frontliners Forum include Qantas, Tourism Fiji, Fiji Airways, Worlds Leading Cruise Lines, Intrepid, Rail Tickets, Cunard, Carnival, Sunlover Holidays, Viva! Holidays, The Cruise Team, APT , Territory Discoveries, Seabourn, Holland America Line, ReadyRooms, P&O Cruises, Insider Journeys, Feejee Experience, Seven Oceans Cruising, Princess Cruises and Qantas Holidays.